All polymer clay. 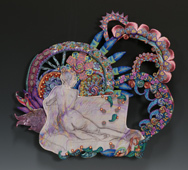 Transferred drawing of a figure (drawn from life by Layl McDill) surrounded by a wonderland of millefiore designs. Hangs on one nail about 3/4 of an inch from the wall.